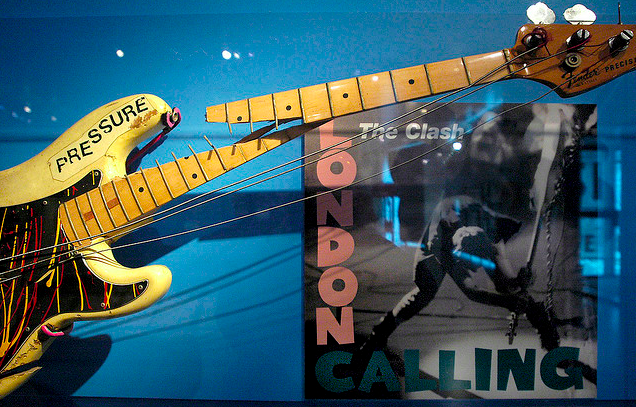 The Fender Precision bass immortalized on the cover of The Clash's "London Calling album was a white early seventies model with a maple neck. Simonon had placed a skull and crossbones sticker on the body, done some drip painting on the pick guard and had handwritten the word "PRESSURE" on the top body horn. Although the body and neck of the bass were damaged beyond repair, the smashed remnants were deemed important enough to be displayed in the permanent collection of the Rock and Roll Hall of Fame and Museum.